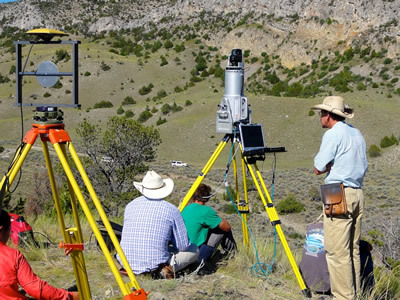 During the summer of 2010, a pilot version of a week-long module designed to apply Terrestrial Laser Scanning (TLS) to various problems encountered while conducting field geology applications was embedded within the Indiana University G429 field course. The format followed that of a successful module developed to concentrate on surface and groundwater hydrology known as G429e. The TLS module was implemented with the aid of UNAVCO, which provided both equipment and professional staff to complement the faculty and staff working in G429. The students who participated in the program were all volunteers aware of the experimental nature of the module. The students' backgrounds varied from those with extensive field instrumentation and surveying experience to those with only the prior field experience provided by the first three weeks of the G429 field course. The targets selected for the TLS work were directly related to scientific questions that arose from projects previously completed by the students. This was critical in that the motivation for the work was scientifically driven and not strictly an exercise in instrument use. The activities for the week built from an initial survey in a small highly constrained location to a final project where the students had to design a plan and deploy all of the instruments, collect the various data types, and analyze the data based on a simple set of criteria, to produce a TLS data set that would allow others to explore the Judson Mead Geologic Field Station. The other problems selected included determining the magnitude and type of normal fault displacement recorded in Quaternary sediment, the potential for using a large bedrock fault scarp to determine displacement intervals, and the geometry of the sedimentary architecture of a shoaling carbonate bank. In addition to the data analysis, the students produced a series of field/instrument set up flow charts. Analysis of the variations in these was not always directly correlated to the students' prior experience with field instrumentation and provided insights into what are critical aspects of teaching students how to employ TLS to solve scientific problems. The project also made it clear how important a set of data recording sheets that provide systematic and guided mechanisms for allowing all of the participants involved in all of the decision making steps necessary to successful TLS data acquisition. Examples included such parameters as spot spacing, scan rates, beam divergence and scan geometries. This presentation includes an overview of the curriculum implemented, examples of data collections and analyses produced by the students, discussion of challenges faced, and thoughts on future work. Figure 1 - UNAVCO TLS scanner during a field mapping exercise for the Indiana University Geology Field Course. Tripod on left is supporting a LiDAR target with dual frequency GPS antenna mounted on top for georeferencing. Tripod on right is supporting the Riegl LMS-Z620 scanner.